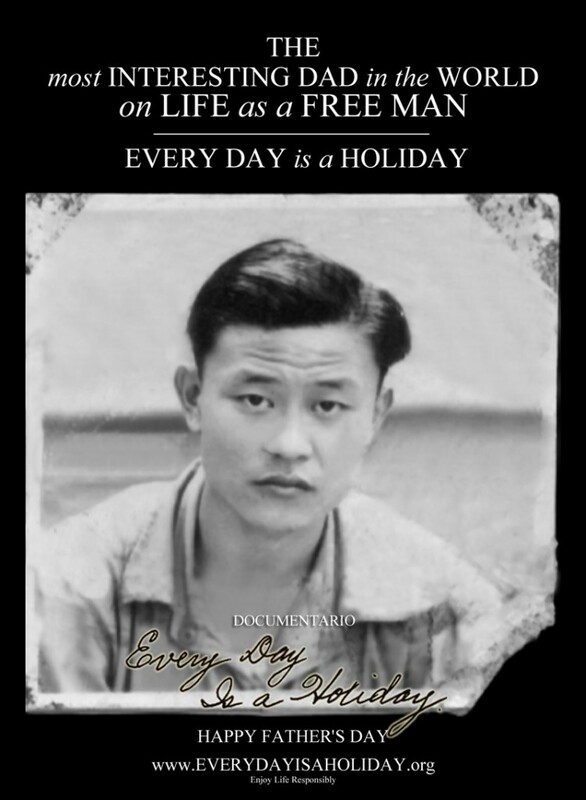 Previously, I covered his attempts to become a US citizen through service in the merchant marine and wartime US Army, both unsuccessful. In the first case, he was thwarted by the whim of an immigration bureaucrat; in the second, he failed because of 12 missing days. 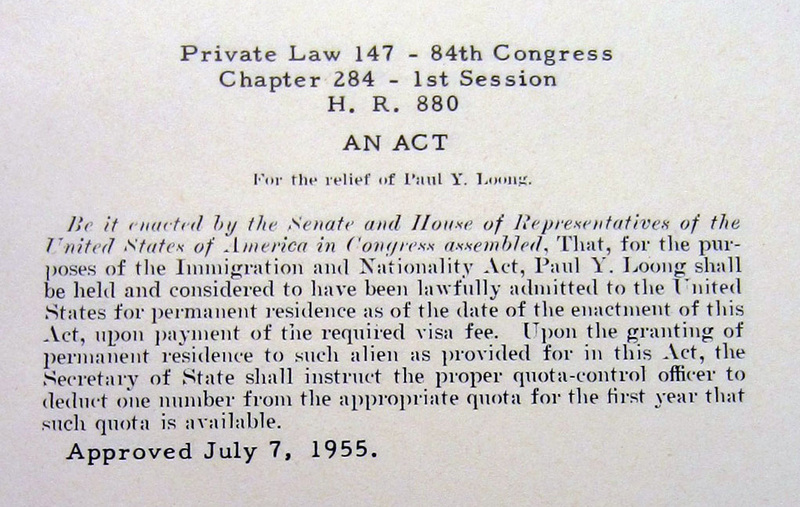 In HR 4233, later Public Law 86 [PDF], members of the Armed Forces serving after June 24, 1950 (the start of the Korean War), could become naturalized citizens — provided they served at least 90 days and were honorably discharged. No problem in either case for my dad. 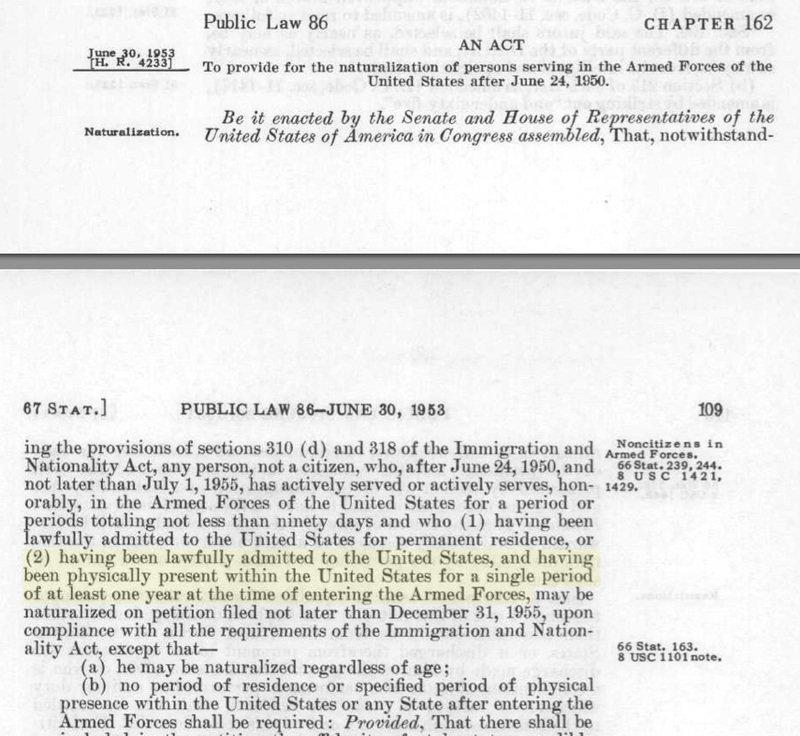 However, the law also required people to have lived in the US for at least a full year prior to joining the military. According to the documentation, Dad had been in the US 12 days short of a year when he was drafted. So instead of becoming a citizen upon discharge, he was nabbed by the INS for being an illegal alien. Get down to Washington, DC and ask a member of Congress — in person — to sponsor a private bill for citizenship on his behalf. And do it as soon as possible. He says that this is the best advice he ever got. Private bills are bills that affect specific people, not the entire public. They tend to deal with citizenship, tax relief, military awards, and veterans benefits, and aren’t as common as they used to be. Like he says in the film, Dad took the train from New York Penn Station to Union Station in DC, and started knocking on doors of Congressmembers. He wasn’t wearing the double-breasted suit you see in some photos, or his military uniform — just simply dressed for the DC summer. Congressman James C. Auchincloss. Public domain photo. At the third or so office, that of James Auchincloss (R-New Jersey-3), he spoke to a woman at a desk, also simply dressed. Instead of a regular staffer, though, this was Lee Alexander Auchincloss — Mrs. Auchincloss. She said she’d ask her husband if he’d help. And he did. If the Auchinclosses hadn’t agreed to help Dad, I’m fully convinced that he would have knocked on the doors of all 435 Representatives and 96 Senators (remember, Alaska and Hawaii weren’t yet states.) Which means he would have been visiting the offices of people like Representatives Sam Rayburn, Lloyd Bentsen, Gerald Ford, Tip O’Neil, and Senators Prescott Bush (father of George H. W.), Everett Dirksen, John F. Kennedy, Harry Flood Byrd, Hubert Humphrey, Strom Thurmond, Al Gore, Sr., and Lyndon Johnson. You know the rest of the story, or at least the result — Dad got naturalized and started the next chapters of his life. Dad has copies of most of the relevant bills and correspondence. 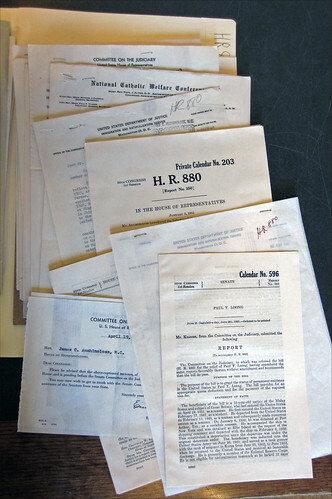 Plus, in 2012, I visited the National Archives, where with the help of a legislative librarian, I was able to find the files associated with the legislation, including the investigative reports, correspondence, letters of recommendation, and more. The dates and the paper trail aren’t really important, just the compassion that one Congressman and his wife showed to a man who wasn’t even an a constituent, and was in fact, an illegal alien. Next post: I’ll cherry-pick some tidbits from his life after getting citizenship, then wrap it all up on Sunday.